When we awoke, we were not prepared for how chaotic the races of the Frontier had become. The ancient civilization of old was very hierarchical and orderly. Each race had its own place within the higher order with everything centralized. Yet in the end, that civilization perished and we slept for almost 50,000 years as a result. We felt out of touch with these races and didn't understand them. There was something that was to unpredictable about them. They defied our sense of order. We gave our children to these new races so that we could learn from them, become part of them, and ultimately understand them. We wanted to understand what role they would play in the Galaxy to see how they would ultimately work together. Welcome to New Horizons. 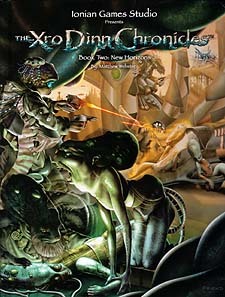 While detailing the young Xro Dinn as player character races, New Horizons radically expands the frontier to include four other new player character races, detailed descriptions of the Ingenii, a ground breaking view of nanotechnology, starship construction, and much more.